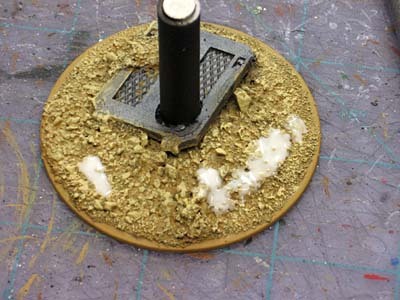 Applying static grass to your bases... how do you get it to look like grass that is standing up and not lying down? I figured it was easy and everyone just glued the stuff on (what did I know) until someone actually sat me down and showed me this way. He used to work for GW and was really big into the modeling and painting aspect of the hobby. I've been doing it like this ever since. I wait until the very end to add the grass. The base is done and varnished when I go back and add it. Using white glue (PVA), I spread it around where I want the grass to be. I have a real old paintbrush I use for this so I can apply the glue where I want it especially if I'm trying to get between elements already on the base. And the whole secret to the thing. You take a huge clump of the grass and set it on the glue. I mean huge... way more than you could use on 20 bases done the same way. Then take your fingers and give it a good pinch. Not so much you're going to break something, but you don't have to be gentle either. Flip the base over, shake off the excess (you can tap the bottom of the base too) to get any loose stuff off. I work over my tub of grass so that the excess falls back into the tub to be used later on. Presto! Perfect looking grass every time. And if you have grass right on the edge of your base and you don't want it hanging over the lip, all you need to do is take your finger and gently push up and it will redirect the grass away from the edge. Knowing I'm not a pro at this, I decided to ask someone with a little more experience with basing and such. Enter Guest Author misterjustin. Avoid applying static grass too heavily -- either by applying a lot in a small area or applying it over the whole base. It works best on a small surface as an accent. This is true even if you're working with a grassland or forest theme where people typically expect to see large quantities of grass. 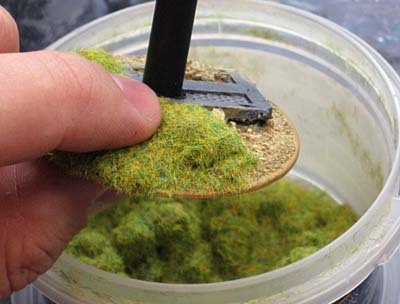 If you're applying static grass over a large area, such as a gaming table, I recommend using a spray adhesive. You can find cans of artist spray adhesive or you can mix PVA and water in a spray bottle and it works just as well. This makes it easy to apply the grass and a second coat will help hold it in place. You can add small clumps of field grass to create wild fields and grasslands and help break up the flat look of static grass. 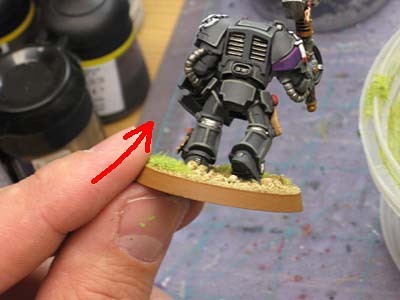 There are a lot of fancy techniques and tools for applying static grass; none of them are practical for basing. 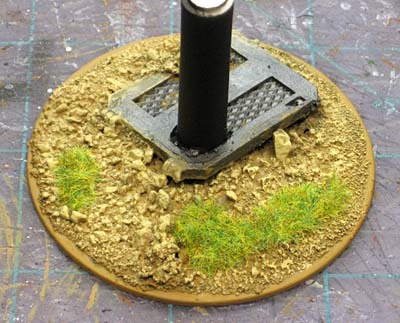 Keep it simple - PVA will let you create a lighter looking grass that you can stand up by gently blowing on it. Cyanoacrylate (CA or superglue) will dry more quickly and make the grass look more dense and flat. So there you have it, my experience and a few tips from someone who knows what he's doing. Really good tips, I've been trying to figure out how to get it to work myself. Some other good tips are to layer the grass with various shades and combine with other flocks/scatters. This creates variation and realism. You can even creat dense scrub by spray gluing the static grass to longer field grass fibers and then adding flock. I would mask off the mini if you are doing this. It works well for scenery though. I am working on some test pieces for a model railway. I shall work up a tutorial and put it on my blog, anyone interested? I've had some good results getting the grass to stand up by giving the bottom of the base a good "flick" of the finger after applying the grass. This works better on plastic minis, since less of the energy is lost in the greater mass of metal. I really like combing snow scatter, ballast and static grass for a wintery effect that has some dimension. As if the snow is just falling or just melting. 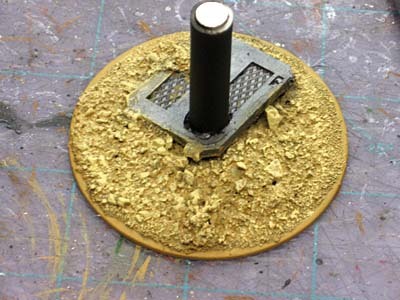 Say no to PVA glue, yes to Matte Medium, especially when basing static grass! Thanks! It help me for my project putting grasss on my artwork surroundings. Tuxedos: While it may simple, it's an often overlooked or unexplained technique for most folks. Giving the Noch bottle a good old shake before puffing the grass onto the base "charges up" the grass with static nicely and it stands up on its own. Doggles: Thanks for the tip. I know model railroaders deal with lots of the same things we do when it comes to weathering and environments, but I've never seen this.